Behavior, Content, Money – 3 Things you should never give away for free!!! With the real, true and unbiased news inevitably moving online towards the so-called “Alternative Media” (which really is almost reaching the point where it is not alternative so much as the first go-to source), its a good idea to start replicating some of the most useful elements from Television, Print and Radio (aka. the rest of the dinosaur media). 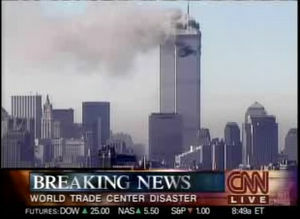 The CNN News Ticker Tape is a somewhat controversial item, as it is considered annoying by many. However, in terms of being able to quickly get information across the screen without interrupting another presentation, it is arguably somewhat effective. Proponents of its use claim it is the best way to get instant updates while maintaining a coherent programming schedule, while critics point to its potential for misuse and indoctrination of the weak-minded with subliminal messages flashing across the screen or fear-mongering sensationalism so common in the “Mainstream Media” today. Taking the bad and the good into consideration, I’ve thrown together a mock-up that could function somewhat similarly to the Semantically Enhanced Video Pop-ups I’ve implemented using Popcorn.js and to replicate the VH1 Pop-up Video effect. You could imagine having the usefulness of having contextual content being inferred based on the content being viewed, or, simply populating a basic news ticker with the entries from an existing RSS or Atom news feed to link to the day’s top stories. 1. We regularly hand over our browser histories, search histories and daily online activities to companies that want our money, or, to benefit from our use of their services with lucrative ad deals or sales of personal information. 2. We create and/or consume interesting content on their services, but we aren't adequately rewarded for our creative efforts or loyalty. 3. We pay money to be connected online (and possibly also over mobile), yet we lose both time and money by allowing companies to market to us with unsolicited advertisements, irrelevant product offers and unfairly structured service pricing plans.